Gareth Southgate feels any potential sanctions following the alleged racist chanting towards England players in Montenegro are "worthless" unless they are accompanied by better education on the subject. The Three Lions recorded a 5-1 Euro 2020 qualifying victory on Monday, but that win was overshadowed by accusations that England players were subjected to racial abuse in Podgorica. Southgate claimed full-back Danny Rose was targeted after picking up a late yellow card and teenage winger Callum Hudson-Odoi said he heard "monkey stuff". 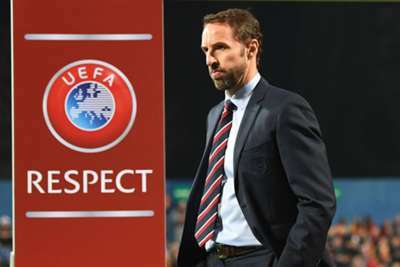 England's manager Southgate confirmed the incidents would be reported to UEFA, but he believes sanctions alone will not get to the root of the issue. "It was clear to everybody that there were comments made," Southgate told a news conference. "Sanctions are only ever of any use if they lead to education. Sanctions are worthless if there's nothing alongside that to help educate people. "My kids don't think for one minute about where people are born, what language they speak, what colour they are. There's an innocence about young people that is only influenced by older people. We have to make sure that the education is right for everybody. "In our country, the same. I'm not sitting here just criticising what's happened tonight because in our country we have the same issue. We're not free of it. "You can sanction clubs but frankly that's not going to stop one or two people who [are] of the mindset from doing what they want to do. "We have to make sure that we educate young people because we have a better chance with young people. We've got to lead that as far and wide as we can." Montenegro's coach Ljubisa Tumbakovic said he did not hear any racist chanting during the contest. "I have not heard nor noticed any chanting, the first time I heard this is now," he told reporters when asked to comment. He added: "First of all, I don't see the reason why I should comment on that. Second, I haven't heard anything. Third, I was thinking of the game so I had to concentrate on the game." Raheem Sterling had urged UEFA to take "a proper stance" against racism by issuing Montenegro with a stadium ban, while Hudson-Odoi, making his first international start at senior level, called on the governing body to "deal with it properly". Southgate added: "I just think it's a really sad evening. "I'm reflecting on, should I have done more? In the end, I tried to protect my players as much as I possibly can. "I'm not the authority on the subject. I'm a middle-aged white guy speaking about racism. I find it a difficult subject to broach. I want my players to enjoy playing football and not be scarred by the experiences."